I-DESI 2018: How digital is Europe compared to other major world economies? The International Digital Economy and Society Index (I-DESI) provides an overall assessment of where the EU stands, compared to non-EU economies, in its progress towards a digital society and economy. 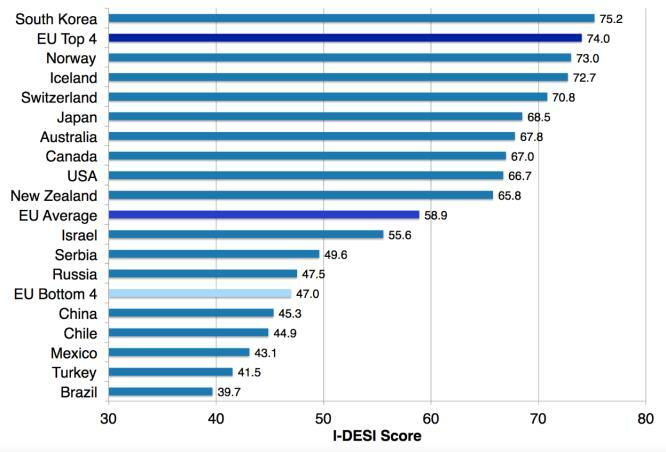 First created in 2013, I-DESI compares the average performance of EU member States with 17 non-EU countries, using a similar methodology to the EU DESI index. It measures performance in five dimensions or policy areas: connectivity, human capital (digital skills), use of Internet by citizens, integration of technology and digital public services. 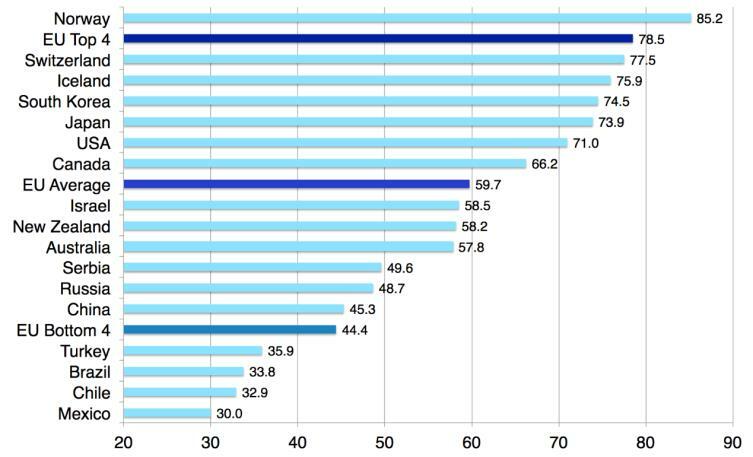 EU Member States, on average, compare well with the non-EU countries and the top EU countries are among the best performers globally: six EU Member States were in the "top ten". The EU average, however, hides important differences between the most and least advanced EU Member State, as shown by the often wide gap between the "top" and bottom" EU Member States in the I‑DESI tables. 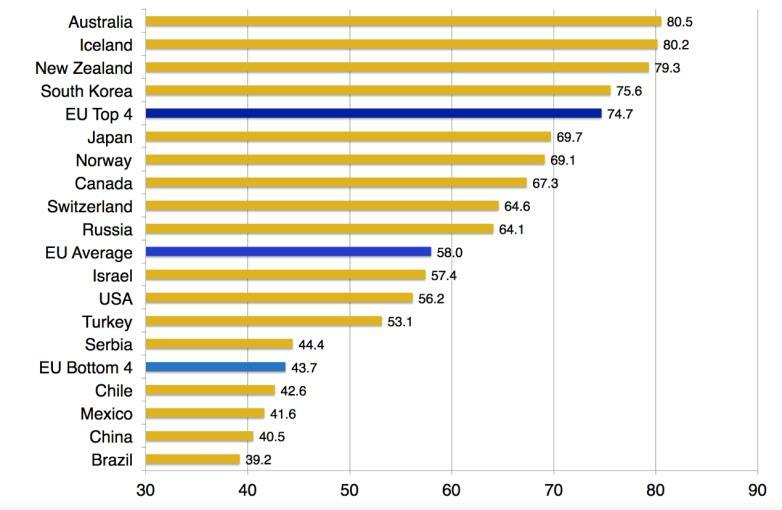 EU countries on average performed well, relative to the 17 non-EU countries, as regards connectivity, in terms of skills and the use of the Internet by citizens. The average EU performance in terms of integration of technology by business also drew level with non-EU countries for the first time since 2013. 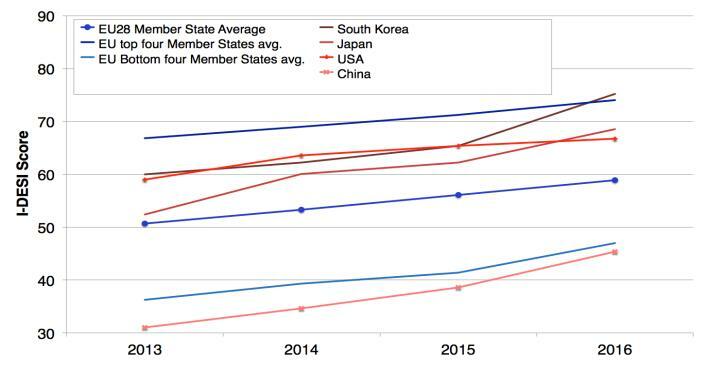 Digital public services is however the one dimension where the EU Member States have consistently tended to perform below their 17 non-EU counterparts in I-DESI. Looking at the evolution during 2013 to 2016, all EU Member States have been progressing regularly in the adoption and use of digital technologies. However, the EU as a whole has not managed to close the gap with the US, South Korea and Japan. For each dimension, results are presented for the entire EU-28, as well as for the "top" and "bottom" four performing EU Member States - the "top" and "bottom" four are not necessarily the same in each category. The 17 non-EU countries covered are Australia, Brazil, Canada, Chile, China, Iceland, Israel, Japan, Mexico, New Zealand, Norway, Russia, Serbia, South Korea, Switzerland, Turkey and the United States. Denmark, leads the I-DESI overall ranking, with a score of 75.9. Denmark was also the leading country in the 2016 EU28 DESI. The leading non-EU country, which came second of all 45 countries studied, is South Korea. 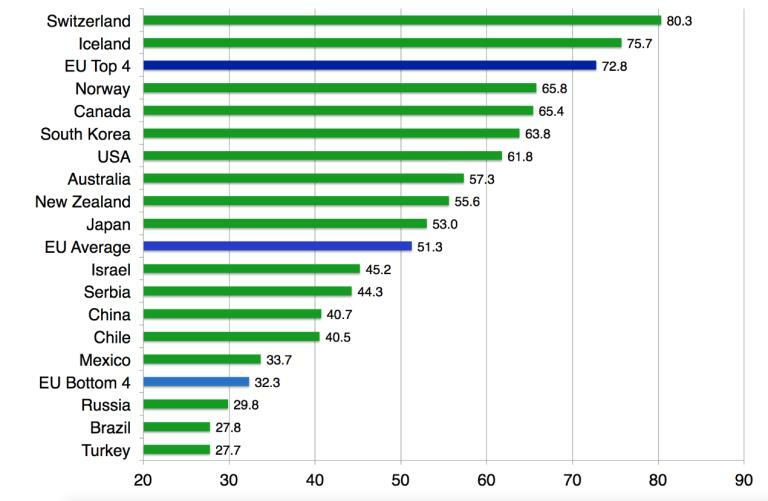 The EU on average compares well with non-EU countries in terms of "connectivity", which measures the deployment of broadband infrastructure and its quality. In 2016, the EU Member State average score in this dimension was 62.9. Only six of the non-EU countries (including South Korea, Japan and USA) scored higher in 2016. EU Member States tend to do better as regards broadband prices and broadband coverage and take-up, while they tend to do less well in terms of 4G coverage and mobile broadband take up – where more non- EU countries outperform the EU. These are the skills needed to take advantage of the possibilities offered by a digital society. I-DESI compares for instance the level of employment in knowledge intensive industries, the number of graduates in ICT or Internet use. In this dimension, the EU also compares reasonably well with the non-EU counterparts. In 2016, the EU average score was 58. 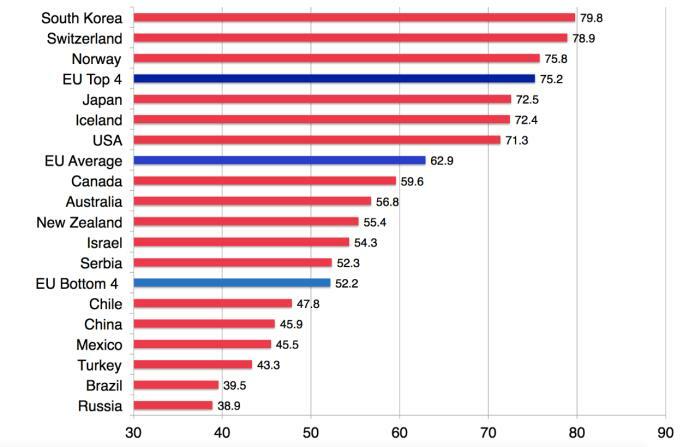 Nine out of the seventeen non-EU countries scored higher, with the EU performing better overall than the USA. The EU Member States tended to score better in terms of employment in knowledge intensive industries, while the EU's weakest area in this dimension is Internet use, with only three of the non-EU countries having lower levels of internet use compared to the bottom four EU Member States. I-DESI compares the variety of activities performed by citizens who are already online: how citizens use online content, how much they use social media, how many devices they own and how many online transactions they carry out – focussing on online shopping and banking. Most EU Member States did better than their 17 global counterparts as regards use of Internet Services by citizens, though they did not significantly out-perform the non-EU countries in any of the sub-dimensions in this field. In 2016, the EU Member State average score for the dimension was 59.7. Seven of 17 non-EU countries, including South Korea, Japan and USA, exceeded this figure. This dimension looked specifically at the digitisation of businesses and the development of online sales. Nine of 17 non-EU countries had a higher score in 2016 than the EU average. The weakest area in this dimension for EU28 Member States is the business use of social media with 12 of the non-EU countries having a higher score. 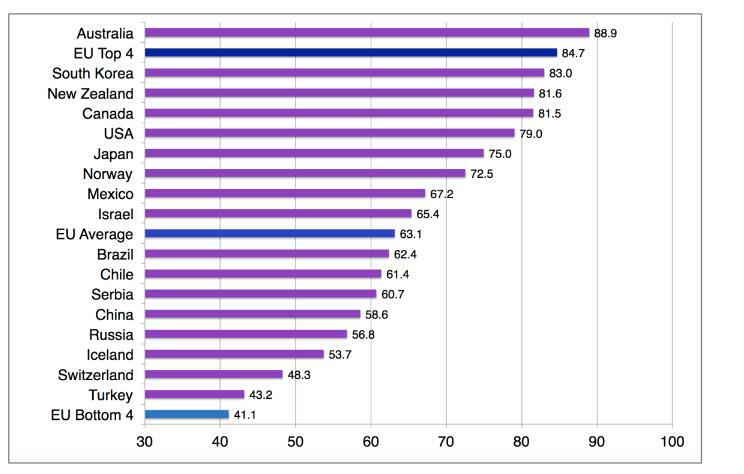 As regards technology absorption and business-to-business Internet, only seven non-EU countries score above the EU average. Digitisation of Public Services - e-Government - is the one dimension where EU Member States performed on average below their 17 non-EU counterparts. Nine of the 17 non-EU countries, including South Korea, USA and Japan) had a higher score in 2016 than the EU average.